The station building has been demolished and a new house stands on the platform. The platform has a fence along the edge and is heavily overgrown and difficult to see. To the east of the station the stone engine shed is in good condition and in agricultural use. Further east two walls of the long-abandoned engine shed are still standing but are heavily overgrown. A roofless wooden platelayers' hut stands behind the engine shed. 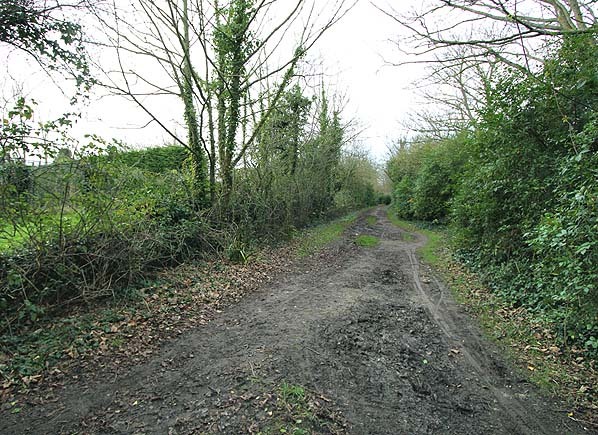 A public footpath follows the track bed through the station site. Notes: The Abbotsbury terminus was sited a little to the east of the village because the railway could not buy the land needed to build the station closer to the village. Plans for a westward extension came to nothing and led to the railway petering out in a shallow cutting to the west of the station. Abbotsbury had a single platform on the down side of the line. A single-storey warm yellowish limestone building with a hipped slate roof and three tall chimneys stood near the west end of the platform. It was similar to the buildings at Portesham and Broadway (Upwey) and was constructed by sub-contractor Edwin Snook of Upwey to a design by William Clark, a freelance railway architect who designed a number of stations on GWR branches. The building incorporated a booking office and waiting room with a flat-roofed stone toilet block at the east end. The building had a wide canopy with a deeply fretted valance supported on six cast iron brackets. There were three gas lamp standards to the east of the building and two to the west; two additional gas lamps were suspended from the canopy. There was one large nameboard at the east end of the platform. Six regularly tended flower beds at the back of the platform gave this delightful country terminus an undoubted charm. There was a run-round loop opposite the platform, but this saw little use following the introduction of steam rail-motors (and later auto-trains) in 1905.
ran diagonally across the yard from the loop to the west of the goods shed; a 5-ton crane stood between the two sidings. Access to the yard was controlled by a signal box opposite the goods shed. In the early twentieth century the box closed and was replaced with a ground frame; the box was quickly demolished. A stone-built 1-track straight 16ft X 48ft dead-ended shed with a gable style slate roof was provided at the east end of the goods yard accessed from the goods loop. There was a stone-built water tower and a 40ft X 12 ft coal stage at the entrance to the shed. There was also a turntable which was described as 'buried' by 1896. The shed was closed soon after the line was absorbed by the GWR. However it was not recorded as out of use until 1906. In the 1930s the shed was a roofless shell, and two heavily overgrown walls are still standing to full height today. A wooden platelayers' hut stood behind the shed. Popular tourist attractions at Abbotsbury included a fourteenth century swan sanctuary at the west end of the Fleet and a sub-tropical garden. By the 1930s the valance had been cut down to half its original depth, and by the 1950s the station was in a very run down state; all the platform lighting had been removed, with a single paraffin lamp suspended from the canopy by a piece of string. The station flower beds were now untended and infested with weeds. After closure the track was lifted in 1955; the station building survived into the 1960s, but by 1970 it had been demolished and replaced with a new house. The station makes short appearances in the 1949 film The Small Back Room made by the British producer-writer-director team of Michael Powell and Emeric Pressburger, starring David Farrar and Kathleen Byron and featuring Jack Hawkins and Cyril Cusack. 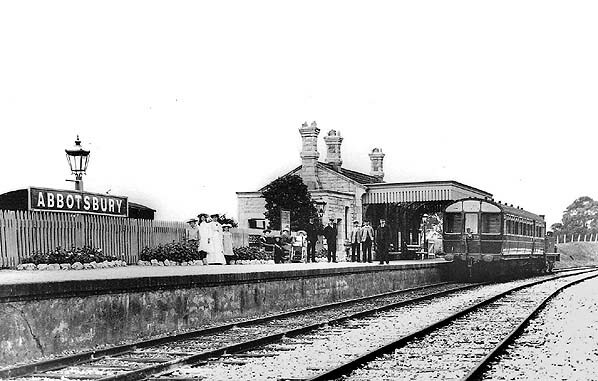 camping coaches were placed at Portesham and Abbotsbury stations; Upwey received one the following year. Track improvements were carried out in 1937/8 when standard GWR bullhead rail replaced the original flat-bottomed rails which had been spiked directly to the sleepers. protests and an improved service it closed completely on 1 December 1952, with only a short section between Upwey Junction and Upwey (originally Broadway, then Broadwey) remaining open for another nine years to serve the goods depot at Upwey. It was built there because the position of Upwey Junction station on the embankment leading to Bincombe Tunnel had always made that station unsuitable for handling goods traffic. Chris Totty. Route map drawn by Alan Young. 1902 1:2,500 OS map. The station building is seen at the left end of the site. The entrance to the goods yard was at the east of the station forecourt. A weighbridge is seen at the entrance to the yard. Abbotsbury signal box is seen opposite the goods shed; this closed in the first decade of the twentieth century to be replaced with a ground frame. Two sidings are shown, the longer loop siding passing through the goods shed to rejoin the running line or run into the cattle dock behind the platform. The engine shed is seen on the far right; it was another early casualty and had already been closed for five years when this map was published. 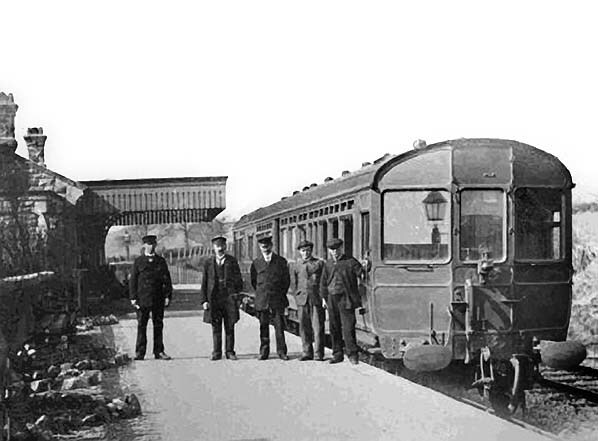 A push-and-pull auto-train stands at the Abbotsbury terminus in the first decade of the twentieth century. The building at Abbotsbury was very similar to other stations on the branch, its wide canopy with a protracted fretted valance providing good weather protection for passengers. A number of wagons are seen in the goods siding behind the platform on the far left. 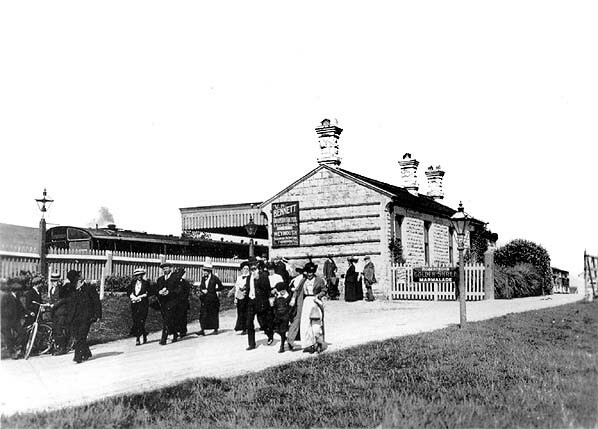 A nicely posed scene at Abbotsbury station c1908. 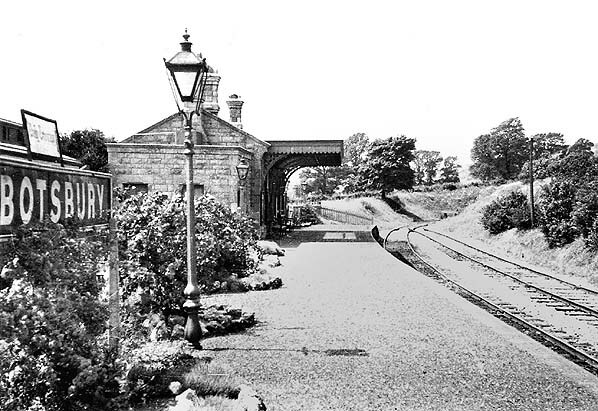 In its early years the attractive station was a well-kept with flower beds. An auto-train stands in the platform, and a wagon is seen in the cattle dock which is at the end of the siding behind the station sign. 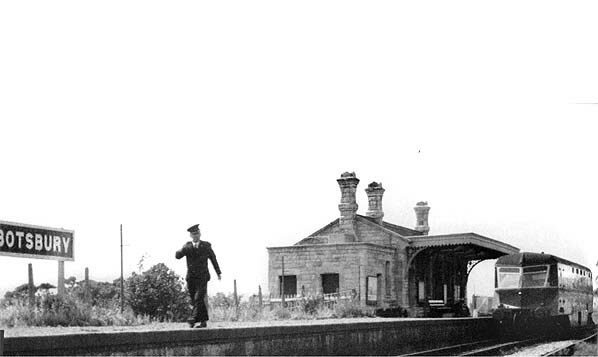 An auto-train stands at the deserted platform at Abbotsbury c1930s. A clerestory coach is seen standing in the cattle dock behind the platform. The typical GWR stone goods shed is seen beyond the station with a van inside. The siding passed through the goods shed before running behind the platform to the cattle dock. 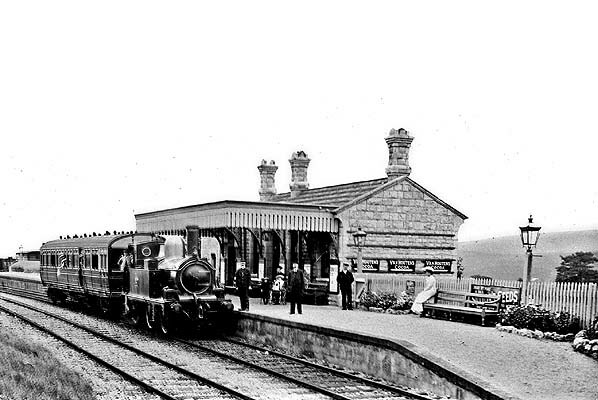 By the 1930s the station flower beds at Abbotsbury were still well kept. The run round loop however, seen here on the right, was rarely used after the introduction of auto-trains. Note the long fretted valance has now been reduced to half its original length. 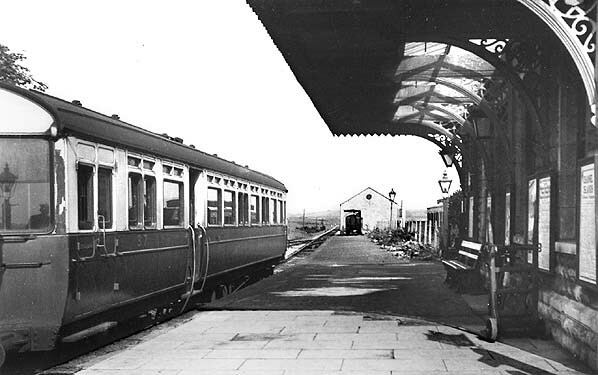 Abbotsbury station in September 1952, three months before complete closure. In an attempt to save money GWR GEC diesel railcars were used on the line. These were the 'first generation' diesel multiple units and were introduced by the GWR in 1933. By this time the station looks very run down: the oil lamps have gone and the flower beds are now overgrown and full of weeds. 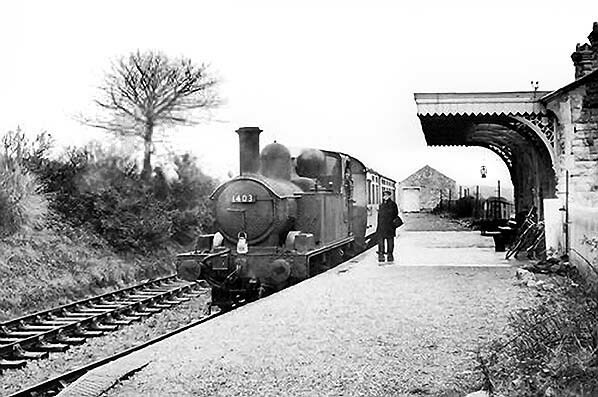 In November 1952, a few weeks before closure, an auto-train waits for passengers at Abbotsbury station. 1403 is a 14xx C.B. 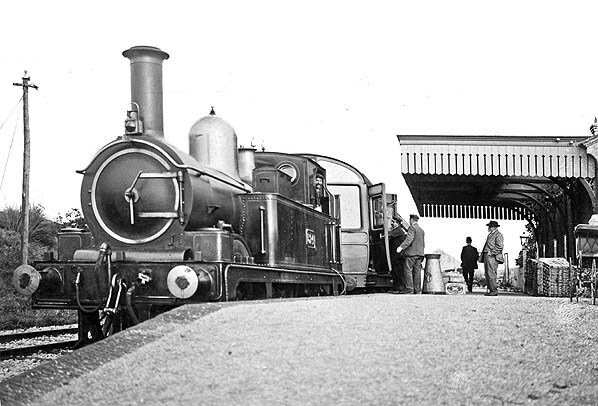 Collett-designed 0-4-2- tank was built at Swindon works of the GWR in 1932. Passing to BR in 1948, whilst at 82F, Weymouth shed, it had a short spell at 82C, Swindon shed before returning to Weymouth in 1952. Withdrawn from there in November 1957, it was scrapped at Swindon in January, 1958. Note all the platform lighting has been removed and replaced with a single paraffin lamp hanging from the canopy. 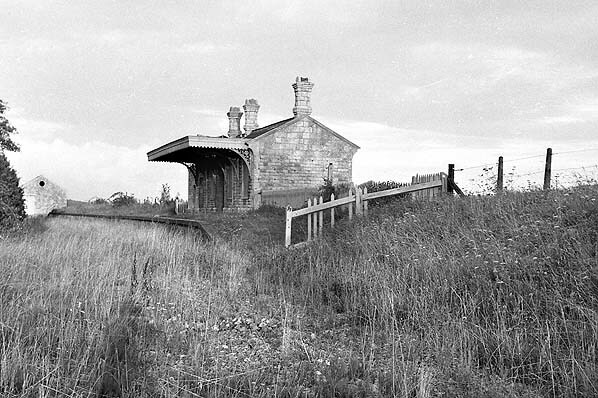 Abbotsbury station looking west c. early 1960s. The track was lifted in 1955. 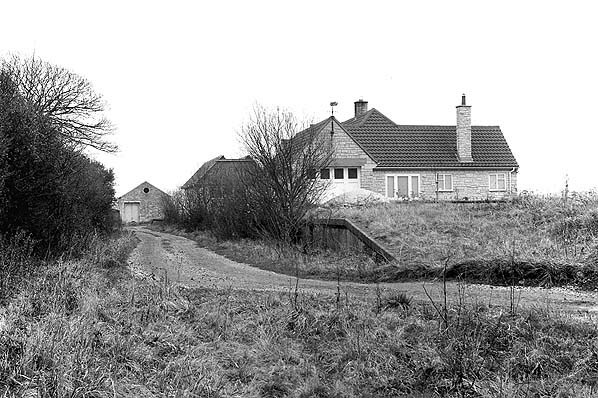 Abbotsbury station looking east c1970; the garage for a new house now stands on the site of the station building. Looking west towards the end of the line at Abbotsbury station in December 2012. The overgrown platform is seen on the left. Although the platform edge is intact for its whole length it is now difficult to see because of undergrowth.